(From left to right): Chengxiang Xiang and Erik Verlage assemble a monolithically integrated III-V device, protected by a TiO2 stabilization layer, which performs unassisted solar water splitting with collection of hydrogen fuel and oxygen. Credit: Lance Hayashida/Caltech A highly efficient photoelectrochemical (PEC) device uses the power of the sun to split water into hydrogen and oxygen. The stand-alone prototype includes two chambers separated by a semi-permeable membrane that allows collection of both gas products. 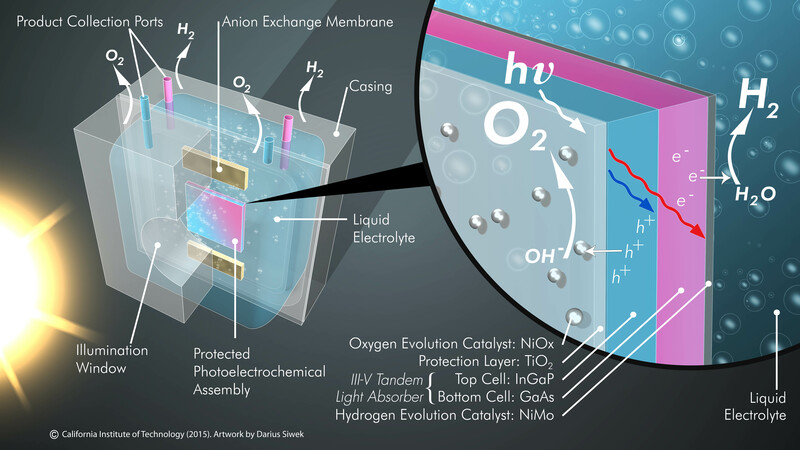 Credit: Lance Hayashida/Caltech Illustration of an efficient, robust and integrated solar-driven prototype featuring protected photoelectrochemical assembly coupled with oxygen and hydrogen evolution reaction catalysts. [View full size] Credit: Image provided courtesy of Joint Center for Artificial Photosynthesis; artwork by Darius Siwek.